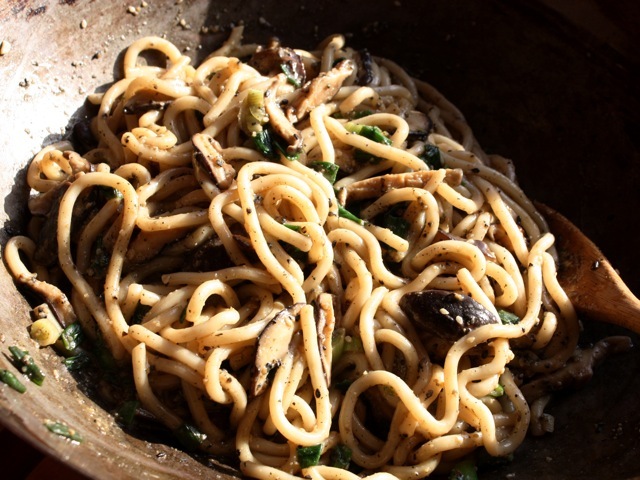 This recipe was adapted from Kentaro Kobayashi's Easy Japanese Cooking: Noodle Comfort. Cook the udon noodles in boiling water (for frozen noodles, about one minute), drain, and rinse with cold water. Heat the vegetable oil in a skillet. Add the mushrooms and scallions and cook until browned and tender, about 6 minutes, reducing the heat if necessary. Add the sauce and stir to coat. Add the noodles and stir until well coated and heated through. Culinate editor's note: Fresh sliced baby bok choy, or fresh or defrosted spinach leaves, make a nice last-minute addition to this dish.